This week we are looking at the statistics of loan funding and each channels share of the total investments on Bondora platform. The trend of more investors choosing the Bondora Portfolio Manager (PM) over API and manual investing continued last month. Over the past month 82% of investments were made using PM compared to its 71% share in June 30, 2016. 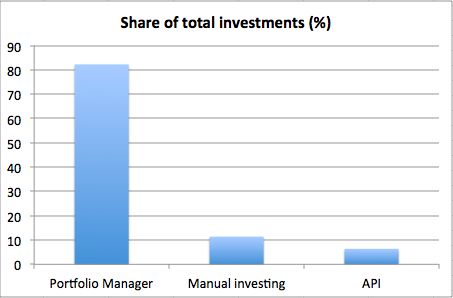 The increased share of the Portfolio Manager investments has mainly come at the expense of manual investments. This broad adoption of the Portfolio Manager reflects the usability and effectiveness of the evolved interface. Bondora PM offers an array of settings. These choices enable the investor to employ a strategy that is every bit as unique as that of a manual or even API user. Diversified risk is easier than ever with the “minimum investment per loan” option. This feature allows the user to invest smaller sums across a greater number of loans thereby defraying risk. The cumulative effect of the PM interface is a smart approach to risk with swift execution. This benefit is evidenced by the fact that each investor’s bid will be applied only to loans with an equal, or lower risk profile than the composition of their whole portfolio. This consistency keeps the users capital in the market where it can grow without unnecessary risk. Additionally, the speed of the interface has increased with the advent of a faster PM. Recent changes have enabled the PM to start running as soon as the loans reach the market. This speed is in contrast to the older model that ran periodically on an hourly basis. Share of manual investments has decreased down to 11%. As already mentioned, manual investments have been decreasing for a while now and the reason being that manual investing is much more limited in terms of speed of investing and data analysis comapred to the Portfolio Manager and Bondora API. Investments through API represented just over 6% of total investment amount on the platform over the month. The share of API investments has been either steady or very slowly increasing. This is explained by the fact that Bondora API has mainly been an choice for those investors more comfortable with programming skills and the nuances of the lending market.